Are you looking for an affordable kitchen faucet? Are you looking for a kitchen faucet that has excellent features and quality? If yes, then you can go for Decor Star TPC11-TO Spray Kitchen Faucet. It will make things very comfortable in the kitchen. In our busy schedule, sometimes it becomes very tough to maintain time for cleaning the plates and pots after usages. Often we tend to keep these things open without cleaning for a long time in the kitchen. It can cause some serious hygienic issues. It is important to clean the mess after using to keep things healthy in the kitchen. To do so, you need kitchen faucets which are very easy to use. The Decor Star TPC11-TO Spray has some features like dual spray head control, high flow, counterweight functions to make cleaning lot easier. This Decor Star kitchen faucet has a high swivel spout and dual spray head control. The spout is even extendable, and you can rinse the dishes with short pull away. You’re getting either stream or spray modes. Therefore, using these features will help you cleaning lots of items very easily. Sometimes, it can be really hard to install a kitchen faucet in the kitchen. Some of them needed to use external tools for installation. Well, not with the Decor Star TPC11-TB Spray Kitchen Faucet. This faucet will ease up you tension for many reasons. You can install the faucet easily in your kitchen. The faucet has standard US plumbing including the connection and the hoses. So, you don’t need to worry about the installation process. In the box, you will get 26-inch-long hot and cold water hoses, pull down spray kitchen sink faucet and manual for easy installation. Therefore, you can install the whole faucet on your own just by following the instruction. The height of the faucet is one of the important factors while working in the sink. When you’re washing a big pot, the height is the important thing to consider. If the height is not that much, then you’ll find difficulty in washing the dishes. Thankfully, the Decor Star TPC11 kitchen faucet has a High Swivel Spout. So, it offers you easy access to the sink and easy washing. Not matter how big the bowl is, you can easily clean it without any problem. 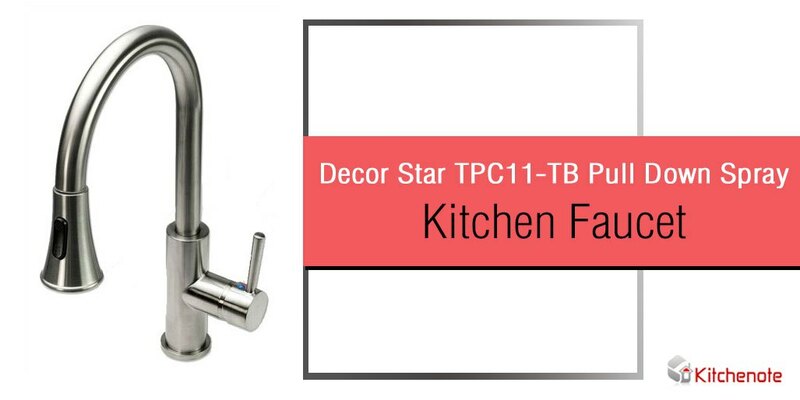 The flow rate of the Decor Star TPC11-TB Spray Kitchen Faucet is very high. It’s 2.2 GPM at 60psi. It’s higher compared to the standard 1.8gpm available in other faucets. So, you can clean a lot of item in a quick time. It’s a unique feature in the Decor Star TPC11-TB Spray Kitchen Faucet Review. With the help of dual spray control, you can get water as either stream or spray. So if you are looking for more control over the water, then you can choose the stream flow. It will save your water during cleaning your kitchen stuff. For quick cleaning, the normal spray will do the job. You can change the pattern of water flow by controlling the dual spray. I love the easy changing features of the stream to spray of this excellent kitchen faucet. The spout is extendable. So you can use the extended spout nearer to the dishes for easy cleaning. Again, you can pull the head to some extent for making your work easy. I love this extra facility of this Décor Star kitchen faucet. On the other hand, there is counterweight action which makes the hose retract back to the kitchen faucet. The faucet is made up of a lead-free brass body. So it’s sturdy, durable and long lasting. It’s rust resistant and finally, gives an aesthetic outlook of the faucet. In the Decor Star TPC11-TB Kitchen Faucet Review, I want to tell you about the finishing material. You can find professionally polished, oil rubbed bronze finishing. Besides, other available finishes are brushed nickel and chrome. The finishing is done so perfectly that it gives the shiny and sleek outlook. We ensure limited lifetime warranty on the product in the Decor Star TPC11-TB Kitchen Faucet Review. It’s only for the USA customer. It’s the US-based customer service. So if you’re out of the USA, you won’t be able to get this offer. The quality component is used here. The ceramic cartridges are added for getting drip-free use. So you can avoid dripping and so the wastage of water with the help of this cartridge. Some of the users of the kitchen faucet may complain about the built material for not being lead-free. But this faucet comes with a construction which does not give any less quality for using for a long term. The dual spray function makes cleaning more user-friendly and versatile. You can use the faucet quickly during heavy cleaning for the high flow of water. So, it won’t be any problem if you have a big family and need to clean a lot of plates and pots in quick time. I also love the design and other feature of the Decor Star TPC11-TB Pull Down Spray Kitchen Faucet. The overall user experience of this faucet is excellent.